You may have heard the term Angel Policy in conjunction with stamping companies. There is no legal validation to the term, but it has become widely used within the craft industry for companies to describe what you can and cannot do with their products. Do not assume that one Angel Policy is the same as another, you should always check with each individual company. 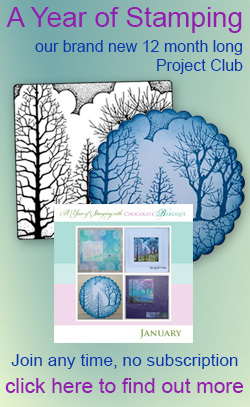 Chocolate Baroque stamps and digital products are copyrighted so there are things that you can and cannot do. When you purchase a Chocolate Baroque rubber or clear stamp, you are agreeing to the conditions of sale outlined on this page, so please take time to actually read it. 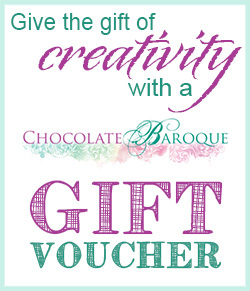 The copyright of all Chocolate Baroque stamp images remains with Chocolate Baroque Ltd and any violation of copyright will be pursued to the full extent of the law. Most of the artwork on our stamps is original artwork created by our in house artists Sue Page and Glenda Waterworth, both of whom retain their moral rights in their own individual works. When you purchase a stamp, we grant you a royalty free licence to sell any physical products that you have made using the actual stamp. That means that you can sell hand stamped cards and other items without paying any further fee to Chocolate Baroque Ltd.
What constitutes a violation of copyright? Creating a hand stamped background, then scanning or photocopying it and using photocopies or prints of your background is a classic example of what NOT to do. At that point, you are no longer using the physical stamp you purchased as an artistic tool, but you are using our copyrighted image as a graphic element without the permission of the copyright holder. Stamping the image, scanning it and making it a digital image is also a violation of copyright. Yes I know there are times when you want it a bit bigger or smaller or flipped round and if you have the skills and the software to do that, that's great, but please don't do it with our stamp images. Stamping images and photocopying them to give to your friends or workshop students is also not permitted. The stamp is a tool, you should encourage your friends and students to use the stamp themselves and get a feel for how much pressure to bear, what inks to use, etc. Stamping images and selling the stamped images. Yes this is technically permitted, but we regard it as unethical as we are giving you a royalty free licence so you can get creative, not so you can simply rip off our drawings. If we catch you at it, we'll probably blacklist you and refuse to sell you any more of our stamps. Alongside our stamps, we also offer a range of digital (downloadable) products, both printable downloads such as backing papers and digital elements that can be incorporated into your own digital and mixed-media artwork. We have a number of different licences for our digital products which you can see here. You can also find further information about our digital products in our download help pages here.